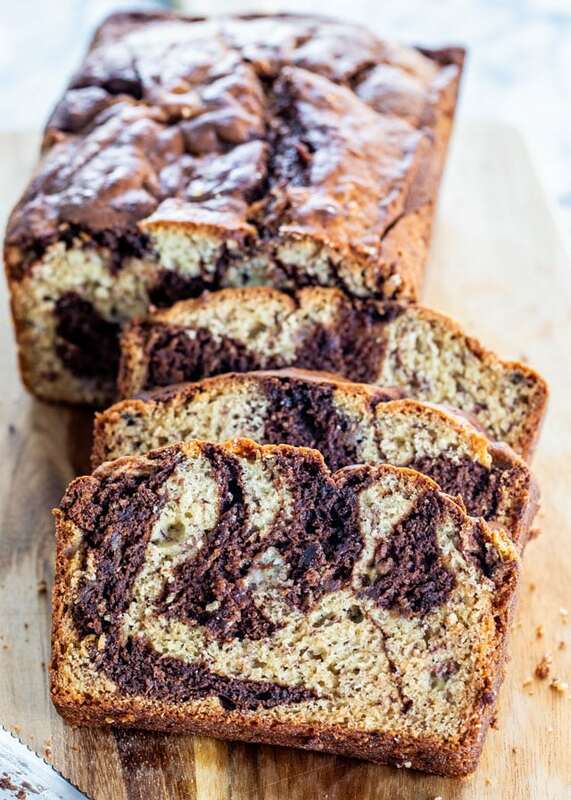 This Marbled Chocolate Banana Bread is a super moist banana bread with swirls of chocolate, simple to make and it’s a true decadent treat! 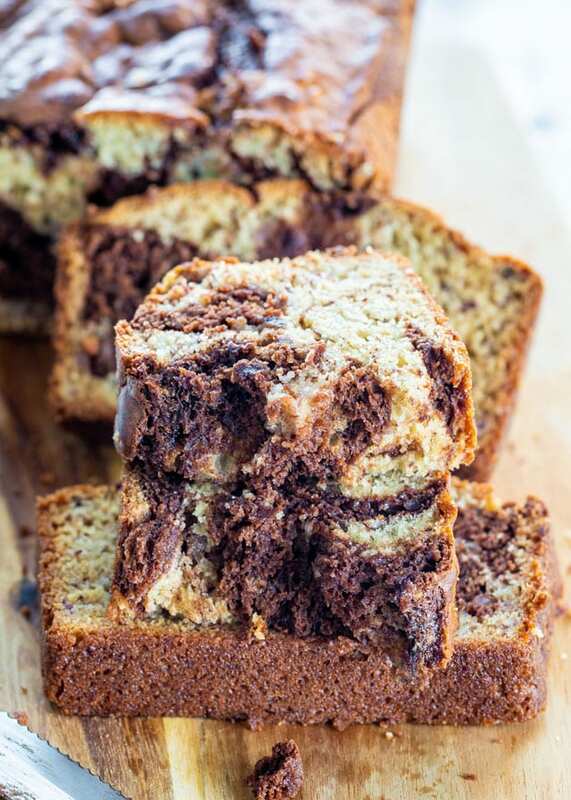 You all know I love a good banana bread but this marbled chocolate banana bread has got to be my favorite because chocolate and bananas are such a classic and delicious combo. I love it for breakfast with my cup of coffee, or I love it as a snack when I want to treat myself. Banana bread is also such an easy bread to make, and this recipe is pretty much a classic banana bread where I take about a quarter of the batter and mix it with some melted chocolate chips. Simple, quick to prep and always a crowd pleaser. I have so many variations of banana bread (check the links below) but when it comes down to it, banana bread is really all about the bananas and in this case the chocolate as well. Flour – good all-purpose flour is all you need. 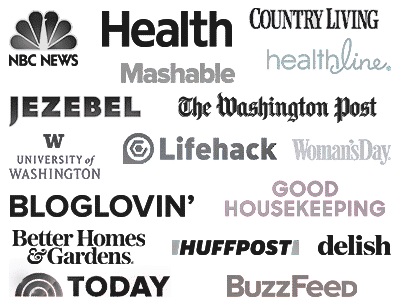 Baking soda – it acts as a leavening agent to create a fluffy and light bread. Salt – to bring all the flavors together. Sugar – I’ve made this banana bread before with just white granulated sugar or I’ve mixed with half brown sugar and half white sugar. Butter – you can replace the butter with applesauce for a lower calorie bread, and still keep it moist. Eggs – eggs act as an emulsifier and make the batter smoother, plus adds volume and texture. Sour cream – adds a little richness to the bread. Bananas – very ripe bananas, you know that point when they turn ugly and brown and nobody wants to eat them? Those are the bananas you want. Chocolate chips – use a good quality dark chocolate chips. Prepare your oven and loaf pan: Preheat oven to 350 F degrees. Spray a 9×5-inch loaf pan with cooking spray or grease it with butter. Combine dry ingredients: In a medium bowl combine the flour, baking soda, salt and mix everything together. Combine the wet ingredients: In another large bowl, add sugar and butter and beat with a mixer at medium speed until well incorporated. Add eggs, and sour cream; beat until blended then stir in mashed bananas. 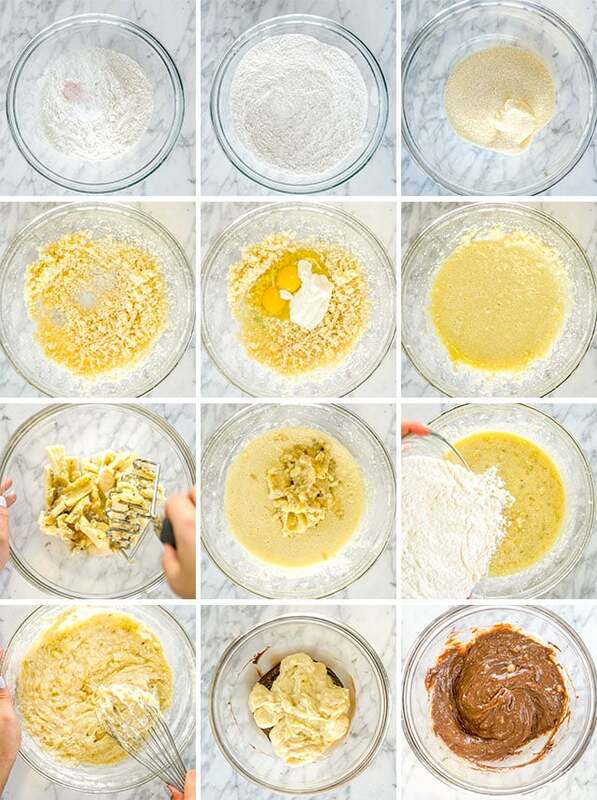 Combine the dry and wet: Add the flour mixture to the wet mixture and whisk or beat at low speed until just moist and all the flour has been incorporated. Melt chocolate chips: Place chocolate chips in a medium microwave-safe bowl, and microwave at high for 1 minute or until almost melted. A minute was enough for me, stir until the chocolate is smooth. Make chocolate batter: Add 1 cup of the batter to the chocolate and stir so that it’s well combined. Spoon into loaf pan: Spoon the white batter first in the greased pan, then the chocolate batter, and swirl batters together with a knife. Or first spoon a layer of white batter, then a layer of chocolate batter, then white batter, then chocolate and if there’s any white batter add it on top. Bake: Bake for about 1 hour to 1 hour and 15 minutes or until an inserted toothpick in the middle of the bread comes out clean. Cool and serve: Cool for 10 minutes in the pan, then remove from pan and continue cooling on a wire rack. Slice and serve. Place the bananas on a baking sheet and bake them at 250 F for 10-20 minutes.This will depend on how ripe your bananas are to start out with. Keep an eye on them and add time as you see fit. If you are okay with waiting an extra day, place your bananas in a paper bag and fold the top to seal off the outside air. This leaves them in a bag full of their own ethylene, which is what causes them to ripen. Adding an apple, fig, or pear to the bag will help them ripen up a bit more. Let your bananas get nice and ripe for this bread. The more ripe they get, the better both the flavor and color of your bread will be. Don’t fear a brown banana! When you mash the bananas, let them stay a little chunky. Those bits of warm soft banana are the best bites. You won’t taste the sour cream in this bread- it gives it a tiny bit of tanginess and so much moisture. You can replace this ingredient with plain greek yogurt, if you prefer. Don’t over-mix! Once everything is evenly incorporated, the batter is ready to go. Be generous with the cooking spray in your loaf tin, especially in the corners. Use a cooling rack once the bread is done baking to avoid the exterior from becoming too dark. This recipe is so fast to throw together, and is also a great opportunity to introduce kids to the baking world. 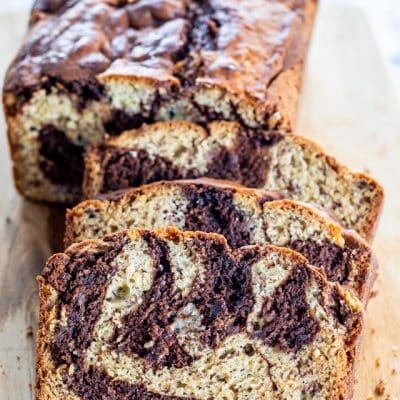 This Marbled Chocolate Banana Bread is a super moist banana bread with swirls of chocolate, simple to make and it's a true decadent treat! Prepare your oven and loaf pan: Preheat oven to 350 F degrees. Spray a 9x5-inch loaf pan with cooking spray or grease it with butter. Combine dry ingredients: In a medium bowl add the flour, baking soda, salt and mix together; Set aside. Combine the dry and wet: Add flour mixture; beat at low speed just until moist. Make chocolate batter: Add 1 cup of the batter to the chocolate and stir so that it's well combined. Spoon into loaf pan: Spoon the white batter first in the greased pan, then the chocolate batter, and swirl batters together with a knife. Or first spoon a layer of white batter, then a layer of chocolate batter, then white batter, then chocolate and if there's any white batter add it on top. Ugly brown bananas make the best banana bread. However, make sure you don’t use fermented bananas, or those where the peel is split. Storing: Wrap banana bread in plastic wrap while still a bit slightly warm, but not hot. This will keep it from drying out overnight. Recipe originally shared Sept 2012. First loaf was just a hair over done, but still good. I watched the time more closely on the mini loaves, and the look fantastic! I must say, overdone or not, the big loaf tastes great; definitely a keeper recipe. I have photos of the minis on the cooling rack – will try to post those. So glad you like these Connie! Don’t make make a great breakfast? Pictures of the mini-loaves are on Instagram. I gave one to a friend last night, and the other 3 are wrapped and in the freezer. The mini-loaves will (hopefully) be a bit of portion control when I have a craving for something decadent! Made this loaf on the weekend and it was amazing. It was eaten so fast there was no time for photos! LOL That’s what I love to hear! I am so making this – one local supermarket frequently has overripe bananas on the quick sale bin, priced so low they are almost free. Next time, will buy a bunch and report on the result. I have no doubt that this is as good as it looks! Yes, I noticed that in my local grocery store too lately, they have bags of over ripened bananas, which are perfect for banana breads. Hope you like it! I made this bread today and it is so moist and delicious! Not only that, but it’s easy to make and the chocolate swirl gives it a fancy “bakery-type” look, like something more time consuming! I will surely make this the next time my bananas look like a Dalmatian! 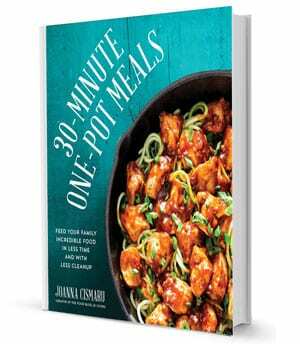 Great for guests or family! Thanks for the recipe! I made this yesterday and it was delicious! My husband and my kids devoured it before the day was over. They told me to only make this one from now on, as I have tried a few banana bread recipes in the past. Looks and tastes amazing. Thanks for sharing this recipe. So glad you guys liked this! What a gorgeous loaf. 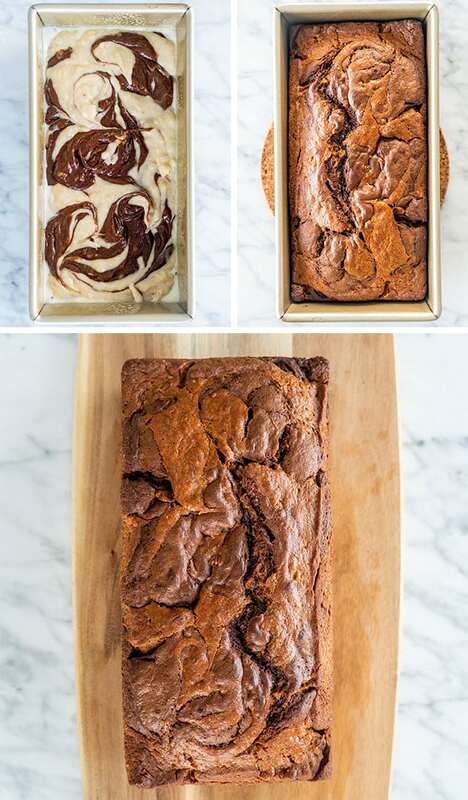 Such a fun way to change up banana bread.